This month's Featured Fit Dad is Noah, a 42-year-old father of 2 boys (Skyler and Gauge) and truly a fitness inspiration. It wasn't until his oldest son approached him about wanting to workout that Noah connected with fitness in a lasting way. It is so awesome to see Noah working out with his two boys in their garage gym or out on runs training for obstacle course races. I also admire and commend Noah for his approach to fitness. As you'll read, to Noah, the aesthetics and the muscular gains are secondary to performance and longevity...although Noah is pretty dang ripped at 42 years old. It's a great perspective that he offers up in his interview, which I thoroughly enjoyed reading, and I think you will too. I started working out in 10th grade. I had a weight training class instead of regular PE. There was basically a coach that let a bunch of teenage boys loose on the free weights. I had no idea what I was doing. I think I did chest every day. As time went on, I always did fitness-ish things but no consistent training until my early 30s. During that time I was married, worked full-time, was continuing my education and raising young boys. I probably worked out for a year or so a couple days a week. After that year I stopped working out and I did not get back into it until my late 30s. My initial motivation for getting back into fitness occurred when my oldest son was about 15. He wanted to work out and learn about fitness. We started working out together at home, eventually got a rec center pass and finally ended up with a big box gym membership. That was the start of my current fitness journey. I love fitness as a whole. I am particularly fond of high-intensity type exercises, functional fitness and OCR-style training. I train year-round to participate in 6-8 Obstacle Course Races (OCRs). I train 4-6 days per week with frequent variation in my training depending on when my next race is. I alternate core muscle group days like chest/triceps/shoulders and back/biceps/legs, but I work in explosive variations, in addition to the core lifts. I don't work out specifically to achieve a chiseled physique. I exercise to increase my capability and capacity for fitness. I train specifically to become stronger, faster, and more capable. If I can maintain a fit look and a six pack, that is a bonus. 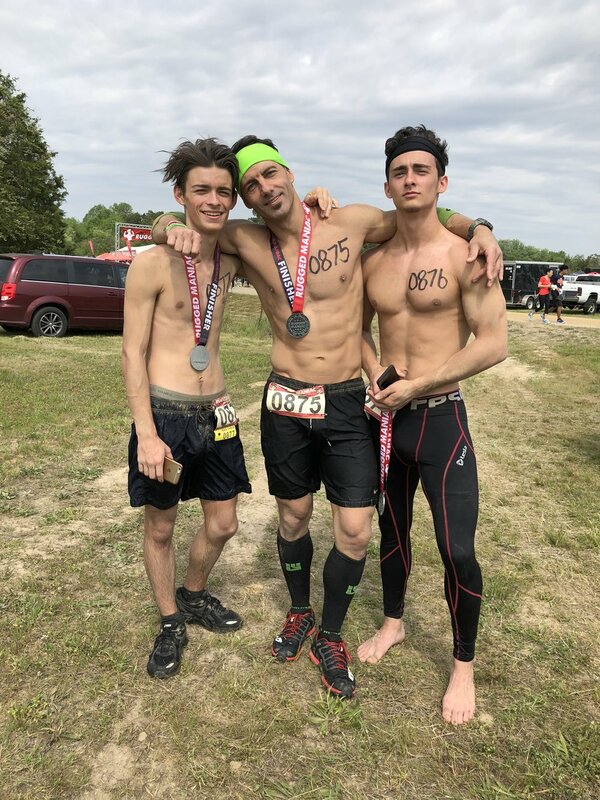 Running my first OCR (Rugged Maniac), my first Spartan Super, and my first Spartan Beast stand out as very memorable fitness moments. When I ran my first OCR, I was not sure what to expect and I was nervous (I ended up loving it). When I ran my first Spartan Super it was at Wintergreen Ski Resort in VA. It is known to be one of the toughest Super courses in the series. When I finished it I was beat down but still on a high from crossing the finish line. Later on I checked the stats and realized I was in the top 10% for my age group. That felt pretty awesome. When I completed my first Spartan Beast in December 2017, it was not only the longest distance (14 miles) I had run, but also completed my first Spartan Trifecta. I also found out that day that I placed 4th in my age group and missed 3rd place by 7 seconds. Of course it would have been nice to place in the top 3, but I was totally stoked with my results. I actually ran that race with a pulled hamstring and almost didn't run that day. I'm glad I did - That doesn't mean you should run when you are injured, folks! Almost anything high-intensity, especially full-body workouts. I get a lot of satisfaction from closing out the week with full-body, high-intensity workouts. I attend a Performance Athletic Conditioning (PAC) class on Saturdays. It is a full body, hour and a half of pure intensity. I love it. As my passion for fitness grows, so does my desire to learn and grow as an athlete. Through my journey, I have created several endurance-based circuits that push me beyond the limits of my comfort zone and offset my traditional strength training. I want them to understand that fitness is more than looking shredded or getting gains. I believe a healthy and fit lifestyle is a continuum that takes you from sickness to wellness to fitness. It is a great way to maintain a positive mental state, feel great about yourself and be part of a community of like-minded people. I am lucky enough to work out with both of my sons. I encourage them to find their own style of fitness that makes them happy. We run OCRs together, work out at the gym together and recently started training together in our garage gym. Fitness can be a very rewarding and uplifting experience if you are willing to make the commitment. Get up and start moving. Explore different fitness activities and find something that you enjoy. Set some goals. You don't have to start big. Pick a goal that will motivate you, keep you accountable and allow you to measure progress at any time. I see so many people get overwhelmed when they set unrealistic goals or even worse, don't set goals at all and get frustrated when they don't see results. Surround yourself with people that motivate you and have similar goals or fitness interests.